1969 Church at 22nd & Union purchased and occupied; first UFMCC General Conference held. 1974 MCCLA purchases and occupies the former Belasco Theater at 11th & Hill downtown. Feb., 1986 Rev. Nancy L. Wilson elected pastor of MCC Los Angeles. 1987 Hill Street building sold and Washington & La Cienega property in Culver City purchased. Jan. 17, 1994 Building Washington Boulevard destroyed during Northridge earthquake. 1996 Santa Monica Boulevard property purchased jointly with UFMCC and occupied. Feb. 15, 2001 Rev. 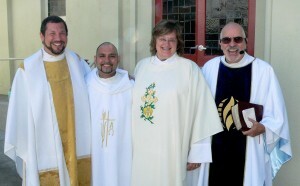 Michael J. Nikolaus serves as MCC Los Angeles’ interim pastor. Nov. 4, 2001 Rev. Neil G. Thomas of Bournemouth MCC, England, elected as Senior Pastor of MCCLA and began his pastorate in early 2002. He was installed March 10, 2002. Over four decades ago, the idea that God loves each of us, just as we are, was a radical theological notion. No more! A single gay man, Rev. Troy Perry, armed only with the belief that all people are able to have a relationship with God regardless of their sexual orientation began a movement that has forever changed the face of the Christian Church. Just 29 years ago, Metropolitan Community Church (MCC) was dismissed as a cult; today that single church has grown to 300 congregations, in 18 countries. Just 40 years ago, mainline clergy were routinely driven from their churches for even being sympathetic to the justice battle for gays and lesbians. Today, there isn’t a reputable Bible scholar or theologian who contends that the Bible condemns homosexuality. But in the late 1960′s, MCC was among a few lonely voices advocating scriptural justice for women and persons of color as well as those in the Queer communities. Today, most denominations have joined in the struggle for human dignity and opportunity for all people. MCC is a safe place to experience personal growth, reconciliation, and healing. In October 1968, a defrocked Southern Pentecostal minister gathered 12 people to preach the gospel — with a twist: All people, including lesbians and gay men, were welcome to worship with him. The charismatic reverend, Troy Perry, was 28 years old when he founded the Metropolitan Community Church. The several years preceding MCC’s founding had been difficult ones for Perry. After coming out in 1963, he found himself without church and family. He was excommunicated by his former church and abandoned by his wife and two sons. But inspired by a vision, he eventually moved to Los Angeles and became both a gay activist and the leader of a new church. Perry’s simple message of “God’s love for all” was popular among gay men and lesbians, and by 1969 MCC had 150 congregants. “Most gays believe very strongly in God, but most churches simply refuse to let them worship Him,” Perry said in a 1969 Advocate interview. “God made all of us. He loves homosexuals as much as any of His children.” In March 1971, more than 1000 people attended the dedication service of MCC’s first permanent home, located in downtown Los Angeles. MCC continued to grow exponentially, with churches popping up in communities all over the country. But the increased visibility came with costs, including arson attacks in 1972 and 1973 at the newly formed San Francisco MCC. Two separate fires in 1973 destroyed the MCC mother church in Los Angeles as well. Last year the church presided over 5000 holy union ceremonies for lesbian and gay couples.